Wall Mounted Pull Up Bars – Are they necessary? If you are new to Calisthenics training, you may be wondering whether or not one of the many Wall Mounted Pull Up Bars available on the market is really necessary. In short, the answer is yes…you will not develop the superior levels of strength on offer with Calisthenics training without incorporating bar work into your program. I’m not going to go into all the pro’s and con’s of all the other types here. If you want the pro’s and con’s of the others, click on the bar type in the list above. Anyway, back to the Wall Mounted variety of pull up bar because that’s what we are here to talk about, and why they are so good. If you are serious about your Calisthenics training you are going to want to invest in a solid, sturdy platform for performing all the bar exercises. This is where the wall mounted variety of pull up bars comes in. 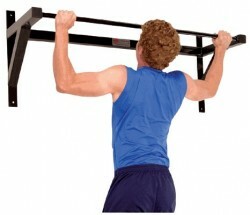 Muscle ups and other exercises can be performed on a wall mounted bar unlike the doorway variety. You can literally hang off one of these all day and not damage it! (Assuming you buy a quality brand of bar of course). The beauty of a good old fashioned pull up bar is that they simple and when used properly, will produce a high degree of functional strength improvement. Let’s go over a few key points that you should keep in mind regarding a wall mounted pull up bar. The muscles utilized when using a pull up bar (of any variety) doesn’t really change. However, some advanced exercises such as muscle up’s are better performed on the wall, ceiling, free standing or outdoor bars. So, as with other bars, a wall mounted pull up bar is going to allow you to target many of the main muscles in the upper body including the lats, the biceps, as well as the traps. You’ll also work the core for stabilization and the triceps will come into play ever so slightly as well as they help guide you through the movement. This makes it a very good compound exercise for adding into any functional strength or plyometric program. 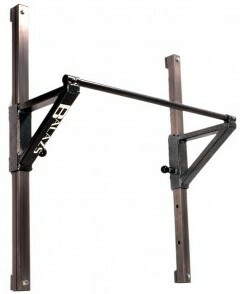 Provides a very stable platform for Pull ups and other Calisthenics bar exercises. A number of variations can be performed, ensuring you don’t reach a plateau. Will improve your functional strength, balance and agility tenfold! Helps to boost muscle development and burn plenty of calories. They are permanently fixed to the wall so where you decide to position the bars is important. You probably don’t want it in your living room! You can’t take them with you if you travel. They are generally more expensive than the doorway mounted pull up bars. When shopping for a wall mounted pull up bar, you’ll want to look for one that has a good max load rating. Check and see what the maximum weight is and make sure that this easily surpasses how much total body weight you will be lifting. If it doesn’t, you’ll risk either damaging the bar or pulling the bar out of the wall. Check to see how the wall mounted pull up bar is secured to the wall. Make sure it’s something that you can install easily and that will work in the particular area you plan on installing it. You may also want to see if it’s listed as having corrosion resistance as over time, this could start to occur and impact the performance of the bar, especially once you start sweating all over it! Make sure that the bar is also long enough that you are able to perform different variations of pull ups, such as wide grip. Also check to make sure that it will “project” out from the wall far enough to ensure you have the clearance you need to complete the more advanced exercises. 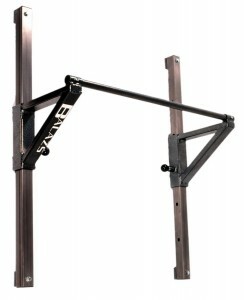 Being able to adjust your bar for height is something you may want to consider as well. Although not necessary, it’s a nice option to have. This allows your to select the height at which you will be performing the exercises. Like most things, quality brands are now commonly found on places like Amazon. More often than not, you can actually get it cheaper there than directly through the manufacturer or supplier! For your benefit, I have listed a few of the top brands below. Description: The Balaz bars are a great bits of kit and come in two varieties, the non-adjustable version and the adjustable version. I prefer the adjustable model as it gives you a lot more flexibility. Both model have a nice wide bar as opposed to the “cheaper” brands that often use a narrower bar. Balaz gear is also manufactured to a high standard. The high quality and adjustability make this my #1 pick! Description: The Power System bar is another high quality option that has both a non-adjustable version and an adjustable version. Like the Balaz bars, it has a nice wide bar as opposed to the “cheaper” brands that often use a narrower bar. Power Systems Bars are manufactured to a high standard. The high quality and reasonable price make this my #2 pick! Description: TDS make good gear and this bar is no exception. It is “commercial level” solid but closer towards the “light” end of the scale! As you would expect from TDS, it is a high quality, well constructed option but is a little pricey for what it is compared to the Power Systems bar. When used properly as part of a functional strength program. you will see excellent results from using a pull up bar. You will see significant strength gains. So, in conclusion, is a Wall Mounted Pull Up Bar necessary to achieve results with Calisthenics….no because you could use another type of bar. However, a wall mounted bar does give you significant advantages over some of the other bars, especially the doorway variety. If you want to find out more about any of the bars featured, just click on one of the links in the “rating area” above. I hope this helps you to decide what will work for you. Oh and don’t forget to leave a comment or sign up to our FREE newsletter below if you want to. To return to our homepage where we highlight the benefits of Calisthenics, click here.